When you hear the name Johann Sebastian Bach you immediately think of the Goldberg Variations, the cantatas, or the serious and almost austere portrait of the Cantor of Leipzig holding a score in his right hand. We don't know if the composer of the Brandeburg Concerto no. 2 had tattoos on his forearm or wore gold chains but Johann S Bach definitely spent a month in prison (from November 6th to December 2nd, 1717) for alleged anti-monarchy activism during his stay in Weimar. After several disagreements Duke William II refused to appoint Bach Kapellmeister of Weimar. The composer therefore needed to leave to seek his fortune elsewhere. But when Bach asked Duke William II for leave his request was denied. One month later when Bach repeated his request he was arrested, according to reports from the court secretary "because of his stubbornness in forcing his resignation". A real gangster! 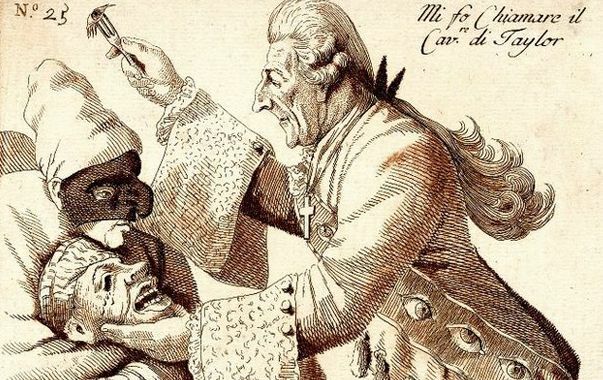 And not just any doctor: Sir John Taylor (1703-1772) carried out two cataract operations on J S Bach's eyes in 1750 and then in 1753 he operated on Handel with similarly poor results. The role of Cantor was not an easy one. As Head of the church choir, Bach conducted, prepared and taught music, as well as Latin and catechism from time to time. He was even occasionally called upon to supervise students as they studied. A report in 1706 said that these charming youngsters "no longer fear their teachers, they even fight in their presence (and) carry swords not only in the street but in the classroom". Though he is known as the Cantor of Leipzig it cannot be said that the city displayed much gratitude towards him. They were also quick to remind him of his short comings. In 1723 a councillor declared "the Cantor does nothing" while in 1730 Bach was reportedly "called to order and admonished". Upon his death a local newspaper quietly announced that "a 67 year old man, Johann S Bach, Kapellmeister and Cantor of Saint Thomas School" had passed away, "without a hearse". His widow bore the brunt of the city's ingratitude, upon requesting payment of the cantor's final salary she found that a sum had been deducted from the total for an overpayment that had happened almost 25 years previously when he first arrived in Leipzig! In his biography of Bach, John Eliot Gardiner highlights the violence of the environment in which the composer grew up. There were gang rivalries, violent students, and sadistic acts. This undoubtedly had an impact on the composer's schooling, and he was absent for around 258 days during his first three years at school. "returning to his lodgings last night he (Bach) saw six music students sitting on stone benches and, as he passed City Hall, an instrumentalist called Geyersbach followed him and punched him, asking why Bach had insulted him. Bach replied that he had not insulted him in the slightest." Did his love of coffee come from frequenting Gottlieb Zimmermann's establishment where he regularly performed in the 1730s? Coffee came to Europe in the 16th century and gained in popularity with establishments taking its name; the first coffee house opened in Berlin in 1670. During Bach's lifetime, coffee was highly fashionable. The composer even dedicated his cantata BMV211 (entitled "Coffee") to the drink. During the course of the song the girl explains that she loves coffee "more than a thousand kisses". In the inventory after Bach's death two coffee pots (one large and one small) were listed, along with a sugar bowl and cups. It should be noted that Bach enjoyed the relative freedoms of Leipzig, far less strict than the Calvinist cities. There is evidence that he had an appetite for luxurious foods including chocolate. A bill for beer and brandy costing more than his rent was also found in his expenses. At least, this is the theory of Welsh musicologist Martin Jarvis, based upon the work of a graphologist who claimed that Anna Magdalena Bach, the composer's second wife, may well have been the alleged author of some of the composer's most important works.